Some houseplant propagation is achieved through seeds while others can be grown via runners. Propagating houseplants with runners produces a replica of the parent plant, so a healthy parent is absolutely necessary. Keep reading to find out how to propagate runners on houseplants. When you propagate from runners and arching stems, it’s called layering. Ivy (Hedera spp.) and other climbers can be reproduced this way. Make sure you water the plant well the day before you choose to perform this method of propagating houseplants. Place a pot filled with cutting compost next to the parent plant. Fold a stem near a node (without cutting it off) to form a ‘V’ in the stem. Anchor the V of the stem into the compost with bent wire. Firm the compost from above and water the compost. Keep the compost moist. This helps the roots develop faster and better. When you see fresh growth at the tip of the stem, roots have been established and you can remove the new plant from it’s mother. Air layering is another way to propagate runners on houseplants and a great way to give a tall, leggy plant that’s lost its lower leaves a new lease on life. 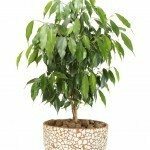 This is often used on rubber plant (Ficus elastica) and sometimes on dieffenbachia, dracaena and monstera. All air layering involves is encouraging roots to develop just below the lowest leaf. When there are roots established, the stem can be severed and the new plant repotted. This is, however, not a fast way to propagate houseplants. Again, be sure to water the plant the day before. Then, using a sharp knife, make an upward cut two-thirds through the stem and 8 to 10 cm below the lowest leaf. Make sure you don’t bend and break the top of the plant. Use a matchstick to keep the surfaces of the cut apart. If you don’t, the wound will heal and it will not readily form roots. You will want to trim the ends off the matchsticks and use a small brush to coat the plant surfaces with rooting powder. After that, take a piece of polythene and wind it around the stem with the cut area in the center. Make sure your string is strong and tie it about 5 cm. below the cut. Wind the string around several times to hold it. Carefully fill the polythene with moist peat. Fill it to within 8 cm of the top and tie it off. It acts like a bandage. Take the plant and place it in gentle warmth and shade. Within two months, roots will show through the polythene. While the roots are still white, cut the stem below the tube. Remove the polythene and string. Keep as much of the peat in the polythene as possible for repotting. 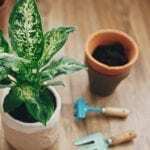 By using these methods to propagate houseplants, you can increase the number of plants you have for your personal use or share them with family and friends.